At the recent 2019 Hong Kong Art week, Art Central kick started the annual arty celebration on the 26th March with an exclusive VIP preview. 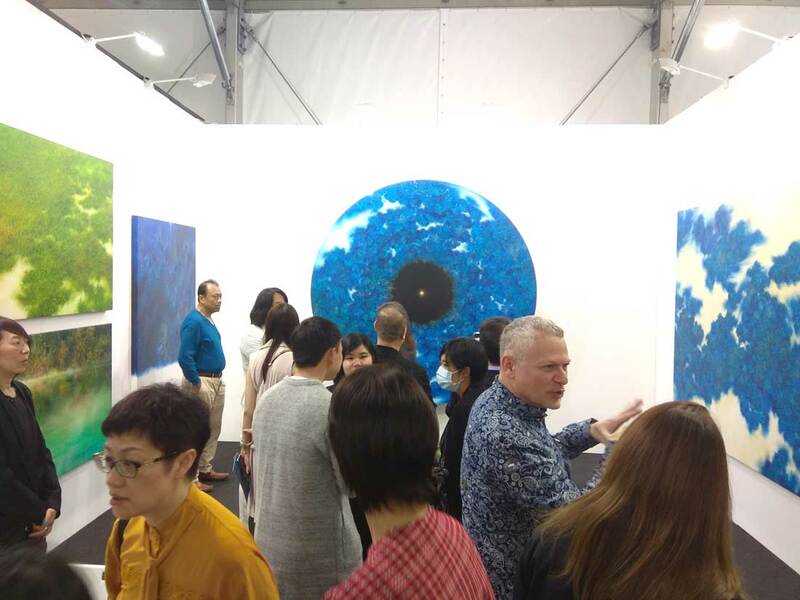 Together with its lead partner United Overseas Bank (UOB), it launched the fair’s fifth edition with the strongest presentation of Asian and global contemporary art to date. Featuring 107 international galleries from across the world, 75% of which hail from the Asia-Pacific region, the fair showcased the most exciting and the best of contemporary art practices. Staged in a custom-designed 10,000 sqm structure on the Central Harbourfront, Art Central was open for public view from Wednesday, 27 March to Sunday, 31 March 2019. The VIP Preview & First Night kick started the fair on the 26 March with many of the VIPs flown in from across the world. Right after the entrance of Art Central, one cannot miss a gigantic metallic brush hanging from the ceiling at the UOB platform. Leading partner for Art Central, UOB presents “The Huge Brush Ink” – special digital interactive artwork created by Victor Wong. “The Huge Brush Ink” by the world’s first TECH-iNK artist Victor Wong provided visitors with an opportunity to create their own ink artwork by selecting the style and colour of the ink strokes via an interactive panel and then moving the huge hanging brush over an LED screen on the floor to create the final artwork. Visitors were also able to take a photo with their unique artwork as a memento. This interactive ink installation aims to raise the public’s interest in ink and to enhance their understanding of different forms of contemporary ink art. On that note, UOB also exhibited the winning works of the UOB Art in Ink Awards, showcasing the achievements of Hong Kong’s artistic talents. The Sovereign Art Foundation’s (SAF) with the commencement of Hong Kong Art Week, launched ‘Year of the Pig’ with a select number of pig artworks was unveiled at Art Central on the 27-31 March 2019. ‘Year of the Pig’ public art project presented a citywide line-up of enigmatic painted pig sculptures at Art Central. Each sculpture represents a unique art piece as interpreted by some of today’s most sought-after local and international contemporary artists. The artworks will also be sold through various means to raise funds to charitable causes supported by the foundation in helping disadvantaged children in the region. Curated by Ying Kwok, PROJECTS provides Art Central with a platform to support the presentation of contemporary art with aspirations of scale and non-traditional approaches. Kwok is an independent curator noted for her inventive curatorial approach, which centres on the ‘boundaries of collaboration’ between curators, artists and the wider community. Ying curated the Hong Kong Pavilion at the 57th Venice Biennale in 2017. Artitute spoke with Heri Dono and Angela Yuen who participated at the 2019 Art Central, whose works were specially curated for the Projects highlights of the fair. Born in Jakarta on June 12, 1960 and trained at the Indonesian Art Institute (Institut Seni Indonesia) in Yogyakarta, where he won the Prize for the Best Painting in 1981 as well as in 1985. Heri Dono’s is an acclaimed artist who has shown his works worldwide in a great number of solo and group exhibitions. Smiling Angels from the Sky is a socio-political satire on contemporary existence narrated through a comical re-enactment of traditional Javanese motifs and mythology. Mr Heri Dono explained to us that the angels represent the positive outlook of our future and his ideals of east and west being united. Born in 1991, Based in Hong Kong. Angela Yuen graduated from the Academy of Visual Arts, Hong Kong Baptist University in 2014. Angela Yuen’s art practice focus on our urban culture, exploring the interrelationship between urban development and city value via her installation and photography works. During its heydays in the 1950s and 60s, Hong Kong was a well-known hub for manufacturing plastic toys which were distributed and sold all over the world. After its handover to China in 1997, many of its productions were moved to China. In 2018, statistic shows an estimated 80% of all toys produced worldwide are made on the mainland. The primary toy production and export bases are Guangdong, Jiangsu, Shanghai, Shandong, Zhejiang and Fujian. To remind visitors of Hong Kong’s history as the hub in toy manufacturing and how, as a city develops, it alters people’s values and culture in each era, City Rhapsody – Project Roseate, a new work by Angela Yuen (Hong Kong) showcased an imaginary skyline made from locally sourced manufacturing toys and objects, each marking a important era from Hong Kong’s manufacturing past in the 1950s and 60s and commenting on the vanishing historical landscape. Mounted on a rotating conveyor, the artwork reminds one of a psychedelic funfair carousel as the light illuminated the toys and casting an imaginary skyline on its surroundings. Among the breathtaking PROJECTS Features and Special Partners showcase, are the backbones of Art Central, the 107 galleries who participated at the fair. Solo exhibitions are the latest highlights for the exhibiting galleries. Solo showcases, which foster greater awareness of a specific artist’s practice, development, and multi-disciplinary approach. Art Projects showcased Hong Kong artist, Damon Tong’s artworks. These include “Point of Contact for 100 Incandescent Lamps”, by experimental installation artist Satoru Tamura by Tezukayama Gallery (Osaka); esteemed Indonesian artist Heri Dono whose large –scale paintings were represented by The Columns Gallery (Seoul) at their booth, alongside a suspended installation Smiling Angels from the Sky in Art Central’s PROJECTS public art sector; Gallery Sumukha (Bangalore) presented a multi-disciplinary showcase by Bengali-born artist Pareish Maity that discusses the accelerated pace of metropolitan living; Art Porters Gallery (Singapore) presented Taiwanese artist Wu Kuan-Te’s solo exhibition Heaven and Earth Eternal, including a monumental painting “The Vast Heart” which was specially created for Art Central Hong Kong 2019, a masterfully executed and labour-intensive magnum opus with elaborate detail. Art Central ended on the 31 March 2019.